It’s Friday already? Thank goodness. This has been a crazy, busy week and it’s only going to get worse this month. But, spring is right around the corner and we are definitely looking forward to it! Not only did he have jury duty, he was selected to be on the jury for a week…long…trial. Aside from missing work, he has really enjoyed this whole experience. However, we are hoping that it will be over today. The only downside is that it has created longer days for all of us since we were both battling different traffic during rush hour and not getting home until later than usual most nights. But, it is what it is and like I said, he’s actually enjoying the whole process. I think it helps that all we watch are lawyer shows, like Suits and HTGAWM. Ha! 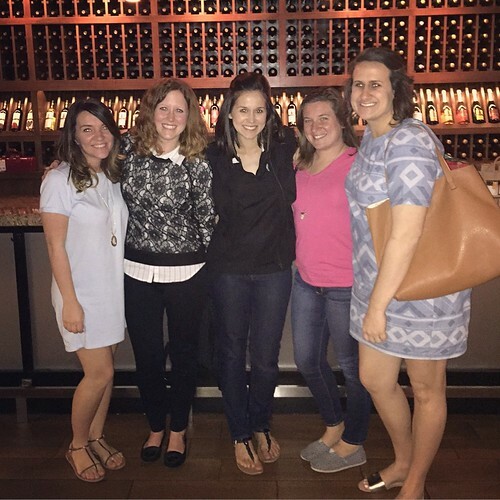 We had girls’ night this week at Cooper’s Hawk. I had a happy heart after dinner and drinks with these amazing ladies. Joy Cho is at it again with another one of her Target collections. She had already released her new home and nursery line and this weekend her layette collection for babies will be available. I mean, give me all the babies. I want to buy every single piece! Better yet, can she make them in toddler sizes? So adorable! Now it’s your turn. It’s a new month, come on over and share what you’re loving!